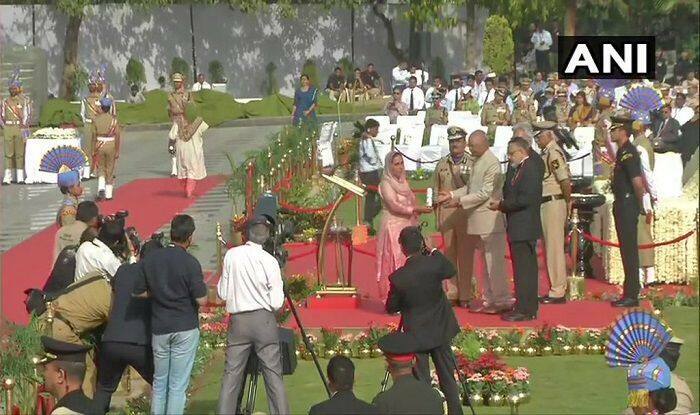 Presenting medals to the families of jawans who were killed in the duty, President Ram Nath Kovind paid a tribute at the National Police Memorial on the occasion of CRPF Valour Day 2019. New Delhi: President Ram Nath Kovind paid tribute to the martyrs of police at the National Police Memorial in New Delhi on the occasion of CRPF Valour Day on Tuesday. Further, he presented medals to families of jawans killed in the line of duty, including the 40 CRPF jawans who lost their lives in the February 14 Pulwama terror attack. The Central Reserve Police Force (CRPF) celebrated the 54th Valour Day on Tuesday in remembrance of the successful battle by a small contingent of CRPF’s second Battalion on April 9, 1965. The jawans had successfully repulsed an attack by a Pakistani Brigade on Sardar Post in the Rann of Kutch in Gujarat. In the battle, as many as 34 Pakistani soldiers were killed and four were captured alive by the CRPF jawans. Besides, the attack also claimed the lives of six valiant CRPF men. Thus to honour their martyrdom and pay tribute to the brave personnel of the Force, April 9 is celebrated as Valour Day in the Force. The National Police Memorial, a 30-foot-tall and 238-tonne black granite structure, was unveiled by Prime Minister Narendra Modi on October 21 last year on the occasion of the police commemoration day. It was for the first time that the President visited the memorial located in Chanakyapuri area of the national capital. Kovind, the Supreme Commander of the Armed Forces, was accorded a “national salute” and presented a guard of honour by a joint column of troops from all the Central Armed Police Forces (CAPFs) such as the CRPF, BSF, ITBP, CISF and SSB.